Wed., May 16, 4pm, Lake Oswego Maintenance Center, 17601 Pilkington Road, 97035. We have an opportunity to do something great for our community. Hallinan Woods is an existing 3.72-acre natural area owned by the city, just north of Hallinan Elementary School in Lake Oswego, Oregon. We have an opportunity to expand this natural area to nearly six acres by adding a neighboring two-acre property to it, and creating more foot paths and educational opportunities here for children and adults. If we don't, a new housing development will go in next to Hallinan Woods, degrading the experience of children and adults who find solace and a daily dose of nature here. The Coalition for Hallinan Woods Nature Park has been working for over a year to develop a partnership between several neighborhood associations and local non-profit organizations with the goal of acquiring the adjacent property and thereby expanding Hallinan Woods Natural Area. Our petition to expand the park has garnered the signatures of approximately 500 city residents, and we are in the process of applying for grants to help fund the acquisition of the adjacent two-acre lot. We now need the community's support to reach our goal of raising $50,000 in private funds. Donations from private donors are essential to securing grant money and will send a strong signal of community support for the project to City Council. Volunteer Barbara Fisher teaches students from Hallinan Elementary School how to remove invasive English ivy from a tree. Without removal, ivy will eventually choke and kill even the biggest trees. Photo by Vern Uyetake, courtesy of Pamplin Media. We are neighbors and parents in Lake Oswego's Hallinan Heights neighborhood. 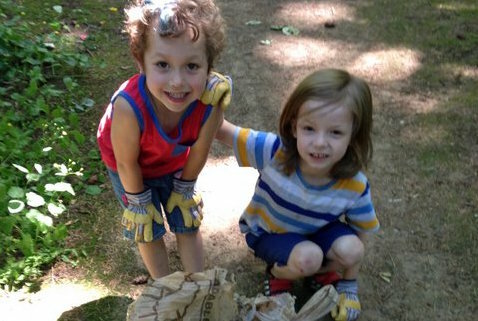 Neighbors young and old have volunteered many hours over the last 13 years to care for Hallinan Woods: removing trash, pulling invasive weeds, and planting native species. Photo by Barbara Fisher. Ready to take the next step? Join us in supporting Hallinan Woods with a donation.